1. Panyu central hospital, Cancer Institute of Panyu, Guangzhou, China. 2. Panyu central hospital, Cancer Institute of Panyu, Guangzhou, China. 3. Department of Radiation Oncology, Sun Yat-sen University Cancer Center; State Key Laboratory of Oncology in South China; Collaborative Innovation Center for Cancer Medicine, Guangzhou 510060, China. 4. Department of Radiation Oncology, Sun Yat-sen University Cancer Center; State Key Laboratory of Oncology in South China; Collaborative Innovation Center for Cancer Medicine, Guangzhou 510060, China. 5. Panyu central hospital, Cancer Institute of Panyu, Guangzhou, China. 6. Department of Radiation Oncology, Sun Yat-sen University Cancer Center; State Key Laboratory of Oncology in South China; Collaborative Innovation Center for Cancer Medicine, Guangzhou 510060, China. 7. Department of Radiation Oncology, Sun Yat-sen University Cancer Center; State Key Laboratory of Oncology in South China; Collaborative Innovation Center for Cancer Medicine, Guangzhou 510060, China. Background: First degree family history of cancer is associated with developing esophageal cancer and sparse data is about the impact on poor survival among established esophageal squamous cell cancer (ESCC) patients. In this study, we investigated the prognoses of patients with ESCC with a family history. Methods: A total of 479 ESCC patients were retrospectively enrolled from a Southern Chinese institution. A positive family history was defined as having malignant cancer among parents and siblings. Kaplan-Meier plots and Cox proportional hazards regressions were applied for overall survival (OS) and progression-free survival (PFS). Results: Among 479 patients, 119 (24.8%) and 68 (14.2%) reported a first-degree family history of cancer and digestive tract cancer, respectively. Compared with patients without a family history of cancer, the adjusted hazard ratios (HR) among those with it were 1.40 (95% CI, 1.08-1.82, p=0.011) for death, 1.36 (95% CI, 1.05-1.76, p=0.018) for progression. Similar results were observed in those with a family history of digestive tract cancer (HR=1.69, 95%CI, 1.24-1.98, p=0.001 for death and HR=1.77, 95%CI, 1.30-2.37, p<0.001 for progression, respectively). Furthermore, there was a trend for increasing risk of overall mortality (p=0.021, p=0.004, respectively), and progression (p=0.022, p=0.001, respectively) with an increasing number of affected family members. Conclusion: A first-degree family history of cancer, especially digestive tract cancer is associated with poor survival for established ESCC patients and plays an important role in prognosis. The patients with a family history of cancer might need a greater intensity of treatment and more frequent follow-up. Keywords: first degree family history of cancer, digestive tract cancer, esophageal squamous cell cancer, survival, prognosis. Esophageal cancer (EC) is the sixth most common cause of cancer death worldwide (1). It has two dominant histologic types: esophageal adenocarcinoma and esophageal squamous cell carcinoma (ESCC). China is one of areas with the highest esophageal cancer incidence rates in the world (1). Around 50% of the worldwide cases occur in China. EC is the fourth most common malignancy in China (2, 3). Moreover, most cases of EC in China are squamous (1). With the development of multidisciplinary treatment (including surgery, chemotherapy and radiotherapy), the 5-year overall survival (OS) remains unsatisfactory. The 5-year OS rates for EC are 20% in the USA, 21% in China, 12% in Europe, and <5% in the lower resource settings, suggesting that primary and secondary prevention are key to reducing mortality from this disease (4). Therefore, it is necessary to identify novel prognostic factors to recognize patients at high risk. In the latest study of ESCC epidemiology, the risk factors have been summarized with consistent evidence. These factors included poverty, tobacco, alcoholic beverages, betel quid and so on (5). There is also substantial evidence for a inherited susceptibility in developing EC based on familial aggregation (6-8), segregation studies (9, 10) and candidate gene/genome-wide association studies (11-13). Importantly, family history of EC has consistently been associated with an increased risk of developing the disease (6, 8, 14, 15). A large scale study of case control design and reconstructed cohort design showed that a doubled risk of ESCC associated with a positive family history of esophageal cancer among first degree relatives (16). Family history comprises a mixture of habits and inherited genes, which are partly determined by genetic factors. Tylosis with ESCC has been linked to the autosomal dominant mutations in RHBDF2 gene and a high risk of ESCC is found in the ESCC patients with Tylosis, with a young age at onset and penetrance estimated to be as high as 90% (17, 18). The latest literature published in Nature has identified some mutation or amplifications of ESCC, offering potential therapeutic targets (19). Mutations such as CDKN2A, BRCA2, were significantly different in patients with or without a family history (20, 21). However, there is no study concerning the question whether family history of ESCC is associated with survival among patients with established ESCC. The associations between a first degree family history of cancer and survivals have been studied in other cancers (22-25). Colon cancer (22) and gastric cancer (23) patients with a first degree family history showed a significant reduction in recurrence and death. Patients with a family history of breast cancer (24) or nasopharyngeal carcinoma (25) had better survivals as well. However, the association of first degree family history of cancer and survivals for patients with established ESCC has not been explored up to now. Therefore, we performed this study to evaluate the effect of a first degree family history of cancer on the clinicopathologic characteristics and survivals of patients with ESCC. Between January 2007 and December 2013, 504 EC patients who were hospitalized at the Sun Yat-sen University Cancer Center receiving radiotherapy were potentially eligible for inclusion in this retrospective study. A total of 479 patients were eventually included who (1) were newly diagnosed, biopsy proven, non-metastasis ESCC, (2) without previous anticancer treatment, (3) had a complete pretreatment evaluation including patient history, physical examination, haematology and biochemistry profiles, computed tomography (CT) of neck, chest and upper abdomen, endoscopic ultrasound and (4) had a complete interview about family history and lifestyle behavior. Medical records were reviewed to extract data from our medical record system. The basic characteristics included age, gender, cigarette smoking status at diagnosis, alcohol drinking status at diagnosis and family history. All patients were restaged according to the sixth edition of the union for international cancer control (UICC) staging system.Those who had a missing information of basic characteristics or didn't complete radiotherapy were excluded. All patients were treated according to our institutional guidelines and national comprehensive cancer network guideline. All patients received radical radiation therapy (RT). Details of the radiation techniques have been described previously (26, 27). The chemotherapy regimens consisted of fluoropyrimidine- or taxane- based regimens (PF cisplatin with 5-fluoropyrimidine or TP cisplatin with taxoids ) every 3 weeks or weekly. The chemotherapy included induction chemotherapy (IC), concurrent chemoraidotherapy and adjuvant chemotherapy (AC). Family history of cancer was ascertained by self-reporting through an interview at the time of the index case diagnosis. We defined a family history of cancer as having at least one first-degree relative affected with cancer (16). The first degree relative included father, mother and siblings. The digestive tract cancer includes esophageal cancer, stomach cancer, liver cancer, pancreas cancer and colorectum cancer (16). Patients were followed up at regular intervals after completing treatment, which were every 3 months during the first 2 years, every 4-6 months during the first 3 to 5 years and annually thereafter. Regular assessment included physical examination, blood test, endoscopy, chest X-ray and ultrasound test. Computed tomography scan of the chest, abdomen, and cervical region was performed at least once a year. For those who could not afford regular follow up visits, a telephone follow-up was performed instead. The follow-up duration was calculated from the first day of treatment to either the day of death or the day of the last examination. Our study endpoints were overall survival (OS) and progression-free survival (PFS). OS was defined as the time from the completion of treatment to death resulting from any cause. PFS was defined as the time from completion of treatment to the first locoregional relapse, or distant metastasis, or death from any cause. Comparisons of demographic, clinical and pathologic variables were performed using x2 statistic or Fisher's exact test for nominal variables as appropriate. The Kaplan-Meier method and log-rank test were used for analysis and comparison of survival curves. The multivariate Cox proportional hazards model was used to estimate hazard ratios (HR) and 95% confidence intervals (CI). Age (<60 years vs ≥60), gender, smoking history (no vs yes), smoking history (no vs yes), T stage (T1/T2/T3/T4), N stage (N0 vs N1), M stage (M0 vs M1a), tumor location, histopathological grading (high vs middle vs low), treatment strategy and radiotherapy technology were included as variables. Two-sided P-values <0.05 were considered to be significant. All tests were conducted using IBM SPSS Statistics 22.0 (Chicago, USA). A total of 479 patients were enrolled as the target population. Of these, 119 (24.8%) had a family history of cancer and 68 (14.2%) had a family history of digestive tract cancer. The baseline demographic and clinical characteristics of patients were compared according to with or without a family history of cancer and digestive tract cancer (Table 1). There were no differences in the distributions of smoking history, drinking history, tumor location, histopathological grading, T stage, M stage, clinical stage, treatment strategy and radiotherapy technology. Significant differences were observed in age, gender and N stage. The patients with a family history were more likely to be younger female and with N0 stage. Demographic and clinicopathologic characteristics of ESCC patients with or without an first degree family history of cancer (digestive tract cancer). Abbreviation: RT: radiation therapy; CCRT: concurrent chemoradiotherapy; AC: adjuvant chemotherapy; IC: induction chemotherapy; 2DCRT: 2 dimensional conventional radiation therapy; 3DCRT: 3 dimensional conformal radiation therapy; IMRT: intensity modulated radiation therapy. + staged according to sixth UICC (union for international cancer control) stage system. In total of the patients, 56 (11.7%) patients received radiotherapy alone. 336 (79.4%) patients received concurrent chemoradiotherapy (CCRT) in those patients receiving radiotherapy plus chemotherapy. 407 (85.0%) patients received radiotherapy with the technology of three dimensional conformal radiotherapy (3DCRT)/intensity modulated radiation therapy (IMRT). The other 72 (15.0%) patients received two dimensional radiation therapy (2DRT). A first degree family history of cancer was associated with a significant high risk of death and progression (Figure 1). The 5 year OS rate was 29.8% for patients with a first degree family history of cancer compared with 43.4% of those without such a profile (p=0.033, Figure 1A). Significant association remained unchanged after accounting for other important prognostic factors, including age group (categorical), gender, smoking status (no vs. yes), drinking status (no vs. yes), histopathological grading, tumor location, T stage, N stage, M stage (M0 vs M1a), treatment strategy and radiation technique. Compared with patients without a first degree family history of cancer, those with it had a multivariate HR of 1.40 (95% CI=1.08-1.82, p=0.011) for death (Table 2). Furthermore, the results for the risk of progression were quite similar to those for death. The 5-year PFS was 24.9% for patients with a first degree family history of cancer and 35.9% for those without (p=0.033, Figure 1B). In multivariate analyses, adjusted HR for PFS was 1.36 (95% CI=1.05-1.76, p=0.018) (Table 2). 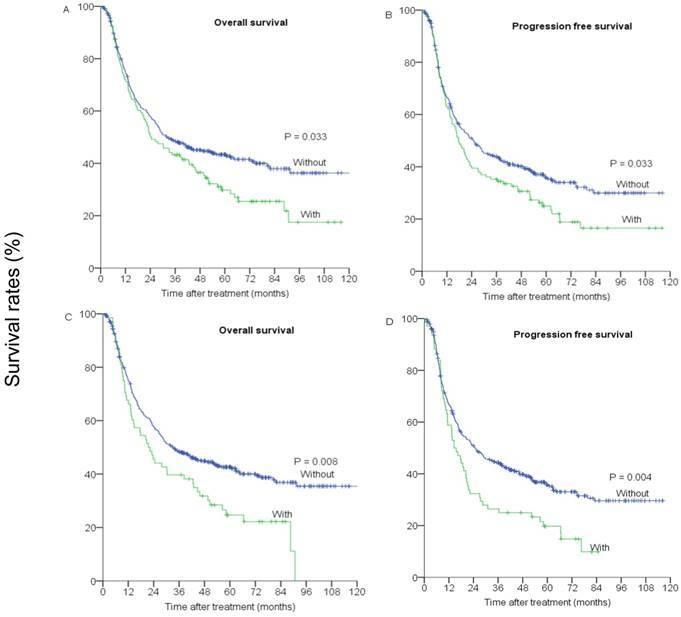 (A) and (C) overall survival, (B) and (D) progression-free survival of patients with and without a first degree family history of cancer (or digest tract cancer). We also analyzed the association between the first degree family history of digestive tract cancer and survival in patients with ESCC. The 5-year OS rate was 24.7% for patients with a first degree family history of digestive tract cancer and 42.6% for those without (p=0.008) (Figure 1C). The 5-year PFS rate was 19.7% for patients with a first degree family history of digestive tract cancer and 35.3% for those without (p=0.004, Figure 1D). In multivariate analysis, the adjusted HRs of death and progression were 1.69 (95%CI=1.24-1.98, p=0.001) and 1.77 (95%CI=1.30-2.37, p<0.001), respectively (Table 2). Abbreviation: OS: overall survival; PFS: progression-free survival. + staged according to sixth UICC (union for international cancer control)stage system. a adjusted by the variables: age (<60 years vs ≥60), gender, smoking history (no vs yes), smoking history (no vs yes), T stage, N stage, M stage (M0 vs M1a), tumor location, Histopathological grading, treatment, radiotherapy technology and first degree family history of cancer (or first degree family history of digest tract cancer). In addition, we assessed the association between a positive first degree family history of cancer (or digestive tract cancer) and OS and PFS across strata of other potential predictors of patients survivals (Table 3). The effects of first degree family history of cancer (or digestive tract cancer) on the risk of death and progress was not significantly modified by gender, smoking and drinking status. Furthermore, in the patients with age<60 years, a first degree family history of cancer had significant association with OS and PFS (adjusted HR=1.49, 95%CI=1.03-2.18, p=0.037 and adjusted HR=1.46, 95%CI=1.02-2.09, p=0.040, respectively). A first degree family history of digestive tract cancer among patients with aged <60 years had the similar results (adjusted HR=1.71, 95% CI=1.13-2.57, p=0.011 for death and adjusted HR=1.79, 95% CI=1.21-2.66, p=0.004 for progression, respectively). The significant impact of first degree family history of cancer on the risk of death and progression remained significant in those patients received radiotherapy combined with chemotherapy (adjusted HR of death=1.44, 95%CI=1.09-1.90, p=0.011; adjusted HR of progression=1.45, 95% CI=1.11-1.90, p=0.006) and those patients with 3DCRT/IMRT technology (adjusted HR of death =1.53, 95%CI=1.14-2.06, p=0.005; adjusted HR of progression =1.39, 95%CI=1.05-1.84, p=0.023). The impact of first degree family history of digestive tract cancer on the risk of death and progression remained significant in those patients received radiotherapy combined with chemotherapy (adjusted HR of death=1.73, 95%CI=1.23-2.42, p=0.001; adjusted HR of progression=1.83, 95%CI=1.33-2.53, p<0.001) and those patients with 3DCRT/IMRT technology (adjusted HR of death=1.74, 95%CI=1.20-2.53, p=0.004; adjusted HR of progression=1.69, 95%CI=1.18-2.41, p=0.004). We also performed the multivariate analysis for the OS and PFS based on the numbers and the type of the first degree family history of cancer and digest tract cancer, respectively (Table 3). Compared with patients without a first-degree family history of cancer, those with one affected relative had a multivariate HR of 1.39 (95% CI=1.06-1.84, p=0.018) for death, 1.38 (95% CI=1.06-1.81, p=0.017) for progression. For patients with two or two more affected first-degree relatives, we observed a multivariate HR of 1.67 (95% CI=0.95-2.94, p=0.075) for death, 1.58 (95%CI=0.93-2.68, p=0.087) for progression. Compared with patients without a first-degree family history of digestive tract cancer, those with one affected relative had a multivariate HR of 1.70 (95% CI=1.21-2.38, p=0.002) for death, 1.81 (95% CI=1.31-2.51, p<0.001) for progression. For patients with two or two more affected first-degree relatives, we observed a multivariate HR of 1.66 (95%CI=0.86-3.24, p=0.134) for death, 1.59 (95%CI=0.84-2.98, p=0.152) for progression. There was a trend for increasing risk of overall mortality (p=0.021and p=0.004, respectively), and progression (p=0.022 and p=0.001, respectively) with an increasing number of affected family members. We also analyzed the association between relative types and survivals. Compared to those without a family history, patients with parents having a family history of cancer had a significant adjusted HR of 1.44 (95%CI=1.06-1.97, p=0.022) for death, 1.40 (95% CI=1.03-1.89, p=0.030) for progression. Similar associations were observed among the patients with parents having a family history of digestive cancer (HR of death=1.84, 95%CI=1.33-2.54, p<0.001; HR of progression=1.91, 95%CI=1.39-2.62, p<0.001, respectively). However, compared to those without a family history, patients with siblings having a family history, no significant results were observed except an adjusted HR of 1.44 (95%CI=1.01-2.06, p=0.047) for progression. Strata analysis of OS and PFS by patients' characteristics in terms of with or without first degree family history of cancer and digestive tract cancer. Abbreviation: OS: overall survival; PFS: progression-free survival; RT: radiation therapy; CT: chemotherapy;2DCRT:2 dimensional conventional radiation therapy; 3DCRT: 3 dimensional conformal radiation therapy; IMRT: intensity modulated radiation therapy. Our study included 479 ESCC patients, among which 119 (24.8%) had a family history of cancer in first degree relatives included parents and siblings and 68 (14.2%) had a family history of digestive tract cancer. The involved patients received radiotherapy and chemotherapy and were from Southern China. The object patients in previous studies from China were from Northern China (7, 9, 10, 16), which the eating habits and the environment were different from Southern China. Our study focused on the impact of patients having a family history of cancer on survival and demonstrated that a first degree family history of cancer (especially digestive tract cancer) is an independent, prognostic factor for poor survival in patients with established ESSC after adjusting for known prognostic factors. Interesting, we found that the HR of OS was close to the HR of PFS. The poor survival after progression of ESCC might be the main reason (28). Our findings were quite different from previous studies in colorectal cancer (29), colon cancer (22), gastric cancer, breast cancer (24) and nasopharyngeal carcinoma (25), which a family history of cancer was associated with a significant reduction in the risk of death. Furthermore, no familial link was found in two case-control study from United States and Swedish, respectively, nether for ESCC or for esophageal adenocarcinoma (15, 30). Our results were comparable to the two studies which the object patients receiving surgery were from West China (31), and Northern China (32). The inconsistency in results might arise from different frequency of ESCC susceptibility alleles (genetic susceptibility) and variation in attributable environmental or lifestyle risk factors, or a combination of both. It is not clear why a family history of cancer affects patients' survival, but variability in adherence to surveillance monitoring, health-related behavior, or genetic differences may explain our observations. Individuals with a family history of the disease may be more sensitive to the signal of ESCC and more likely to undergo the early diagnosis and treatment, which may make bias. In our study, most patients were local advanced stage. We believe that the bias from the early diagnosis and treatment effect could be minimized in our study by adjustment for tumor stage. Further study on early stage ESCC is needed to clarify this point. Health-related behavior may contribute to this survival difference. Patients with a family history of cancer were more likely to have a similar behavior. The risk of developing EC was slightly higher for siblings, compared with parents, indicating that recessive or X-linked susceptibility genes might be involved in the occurrence of ESSC, and the siblings share more lifestyle risk factors. No significant effects of family history were observed in second- or third-degree relatives (23-25). The second- or third-degree relatives are less likely to share similar susceptibility genes and lifestyle risk factors. Lifestyle risk factors such as tobacco smoking or alcohol intake was associated with poor prognosis in ESCC patients. Exome and whole-genome studies also reveal the importance contribution of genetic susceptibility to the occurrence of ESCC (33-35). A study proved that for a disease with notable familial aggregation, environmental factors alone cannot account for such a strong aggregation (36). In addition, one study showed that a younger age of ESCC development results from the interaction of environmental and genetic risk factors (37). So we inferred that environmental and genetic risk factors might cooperate hand in hand affecting the survivals. In our study, we also have collected the exposure information of the ESCC patients. We tried our best to distinguish the effects of genetic susceptibility from the environment factors. In the multivariate analysis including smoking status and drinking status, a first degree family history of cancer (especially digestive tract cancer) remained significantly associated with poor survival. In the strata analysis by smoking status and drinking status, we got the similar results, too. The HR was higher in patients without a smoking history than those with. Therefore, we inferred that a family history and smoking history cooperated and a family history might play a more important role. Finally, we also analyzed the associations between the survivals and the numbers and the relative type of patients with a family history. The previous study of the impact on survival didn't take the exposure into consideration, though similar results were obtained (7). Further researches into genetic differences and environment factors were needed to fully elucidate the potential mechanisms. As in the previous studies demonstrated a strong tendency toward familial aggregation, genetic susceptibility may play a role in the etiology of esophageal cancer and affect the survivals. Loss of heterozygosity (LOH) is more common in patients with a family history of upper gastrointestinal cancer than in those without such history (38). Two markers (D6S1027 on 6q and D9S910 on 9q) had significantly more LOH in patients with metastasis, and one marker (D4S2361 on 4p) showed significantly higher LOH in patients with a lower pathological tumor grade. These might explain why the patients with a family history have a poorer survival. LOH is significantly associated with poorer prognosis of glioma patients and colorectal cancers (39, 40). In our study, we found that the HR of a family history of digestive tract cancer was higher than those with a family history of cancer (not only digestive tract cancer but also other types of cancer). In the study by Chen, the HR of excess ESCC risks of a family history of digestive tract cancer was 1.55 (95% CI=1.23-1.96), higher than those with a family history of any cancer (adjusted HR=1.43, 95% CI=1.13-1.81) (16). We inferred that the patients with a family history of digest tract cancer were more likely to have the genetic susceptibility than those with a family history of cancer. Further studies are needed to determine the influence of this genetic difference on the observed survival differences according to the family history. The following limitations of this study deserve comment. First, the sample may be small. However, in the study reported by Tian, the cumulative risk of esophageal cancer to age 75 was 12.2% in the first-degree relatives of cases and 7.0% in those of controls (hazard ratio= 1.91, 95% CI: 1.54-2.37). The incidence of family history among esophageal cancer patients was not high. Our involved patients were strict to those who treated with chemoradiotherapy in our single institution of Southern China. We did not involve patients who received surgery or treated in other different institutions. Our results were comparable to the previous studies that patients treated with surgery and were from Northern China or West China (31, 32). Second, like other retrospective studies in EC, the treatment regimens were not totally consistent with the latest NCCN guidelines and the stage was based on the sixth UICC stage system, not the latest seventh UICC stage system. The latest seventh UICC stage system of ESCC is more widely applied to those patients undergoing surgery. During the period when patients were treated, many patients were encouraged to participate in randomized trials, which also resulted in heterogeneous strategies. But we performed the multivariate analysis and strata analysis accounting for RT technology and chemotherapy regiments. Third, we have neglected and missed the data of education and incomes of patients. Low education and low income increase the risk of each subtype of esophageal and gastric cancer (41, 42). Educational attainment and income also might play an important role in treatment choice for patients, which have an impact on survival. Higher household income was associated with a 33%-38% decrease in risk for death (43). In our study, we selected those patients completing radiotherapy and chemotherapy to reduce the bias. Fourth, in our study, we relied on self-reported family history and might possibly misclassify family history status and we could not collect the information on the age at which the first degree relative was diagnosed with cancer, as the effect of family history might be different according to it. In addition, it is not clear why a first degree family history of cancer affects survival of patients. Our study showed young patients accounted for a much higher proportion among the patients with a family history of cancer (or digestive tract cancer), which strongly supports an assumption of surveillance monitoring for individuals with a family history. Patients with a family history had a lower percentage N1 stage than those with a family history (p=0.033, p=0.007, respectively). Furthermore, the patients with a family history had a poorer survival than those without a family history, which might indicated that the biological behaviors were more aggressive than those without a family history. Underlying molecular and pathogenic differences might play an intrinsic role in the effect of family history. Further basic researches into genetic differences were needed to fully elucidate the potential mechanisms. In conclusion, our study showed poorer survival for patients who had a first degree family history of cancer (especially digestive tract cancer) than for patients without this profile. Further studies are needed to explore the biological, genetic or behavioral differences in ESSC according to the presence of family history. EC: esophageal cancer; SCC: squamous cell carcinoma; ESCC: esophageal squamous cell carcinoma; CT: computed tomography; UICC: union for international cancer control; RT: radiation therapy; NCCN: national comprehensive cancer network; IC: induction chemotherapy; AC: adjuvant chemotherapy; OS: overall survival; PFS: progression-free survival; HR: hazard ratios; CI: confidence intervals; CCRT: concurrent chemoradiotherapy; 3DCRT: three-dimensional conformal radiotherapy; IMRT: intensity modulated radiotherapy; 2DRT: two-dimensional radiotherapy. We appreciated all individuals, particularly the people of Clinical Research Ethics Committee of Sun Yat-Sen University Cancer Center, including doctors, nurses, coordinators, and the Data Management team who generously spared their time for the accomplishment and fulfillment of this project. This retrospective study was approved by the Clinical Research Ethics Committee of Sun Yat-Sen University Cancer Canter. Patient records were anonymized and de-identified prior to analysis. Raw data may be available on request from the corresponding author. SZ, ZGR, LQ and XFY designed the study; SZ, MYP, and OYPY collected the data; SZ, ZGR, MYP and OYPY analyzed the results; SZ and MYP drafted the manuscript; SZ, ZGR, CXL and XFY revised the manuscript. LQ and XFY are responsible for the overall content. All authors have read and approved the final manuscript. Corresponding authors: xiefy0758com and liqun0799com.